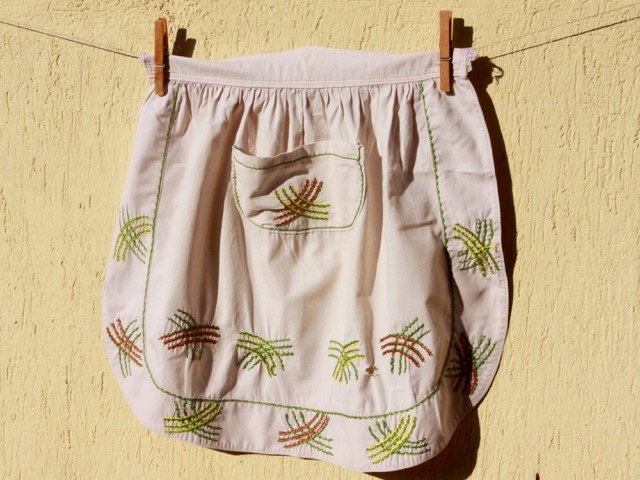 My love for aprons must have its source in this first one I embroidered for my mother when I was six years old, on the opportunity of the Mothers' Day Celebration. Our school teacher brought the aprons in the class room and taught us the embroidery skill. I can still remember the incredible feeling of pleasure I had doing this embroidery, and the great satisfaction after realizing that I was able to do myself such a "chef d'oeuvre"... needless to say the extreme proudness I felt when offering it to my mother!! The funny thing is that she used it all her life, and I can still remember her in the kitchen wearing this apron. I think she never had another one! The second apron was done and used by my mother-in-law. Kind of charming patchwork. 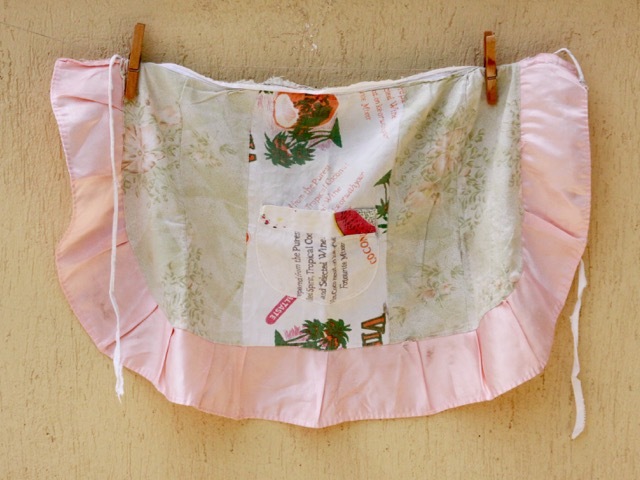 I had myself sewn many aprons of all sorts in the past. Here is My daughter's apron. I think it is wonderful that you now own and cherish both of these aprons and that they hold so many wonderful memories! I have two aprons, one my aunt and one my mother embroidery and they both were used. Quel dommage qu'on ne fasse plus de couture à l'école..... Voici deux magnifiques pièces remplies de souvenirs ! Of course, you had sophisticated taste even as a child! I love the embroidery design and rope-like stitching. Your mother took very good care of this apron. It's lovely that she used it for so long. As a teacher, it warms my heart to know that someone took the time to teach these skills to your class of school kids. I learned embroidery as a child, and it has kept me happy all these years!! I went to take a peek at your daughter's apron. How fun that she likes vintage!! Any apron would look stunning in her, she is beautiful!! Enjoy all the aprons of the women in your life. What wonderful memories and you shared them with us! Thank you! I find it fabulous that your mother wore only yours and that she took such good care of it, that is extremely special. I have never worn an apron and just a few months ago, I made my first 3 for a family reunion and everyone loved them (including me). I will certainly be sewing many more from now on. 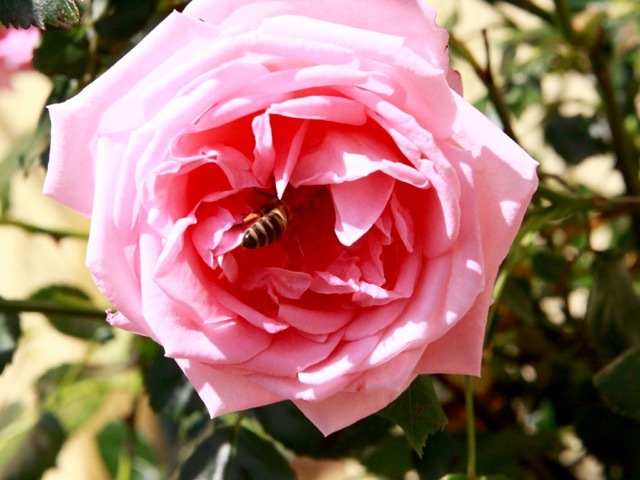 Thank you again for sharing and have a wonderful creative day! How wonderful that you have both of those apron in your collection. I can't imagine elementary students doing that now days, but maybe they should! Thanks for sharing your memories. Beautiful aprons and beautiful memories. Thanks for sharing! 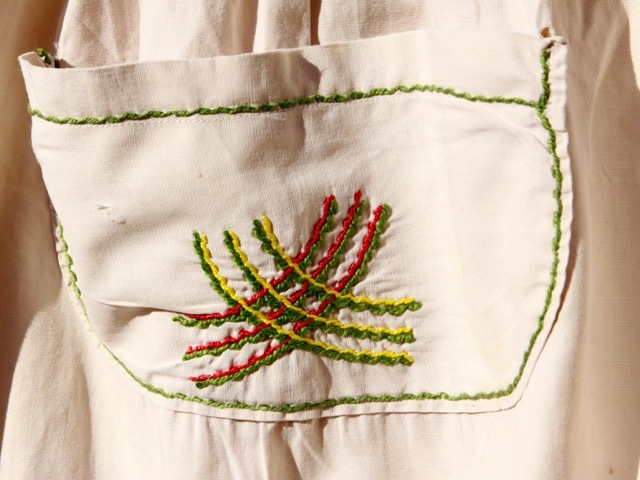 Lovely old aprons, I love that they are embroidered and I remember Aunts and neighbours and Mum wearing these wearable works of art! superbe histoire émouvante! La petite fille était déjà douée! !